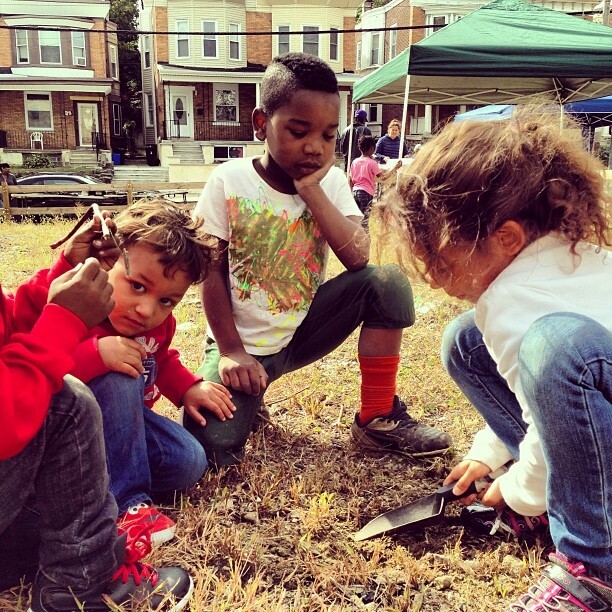 What one Philadelphia city block can do to change its future. One of the biggest issues facing W Rockland Street has been managing the block’s new public spaces. 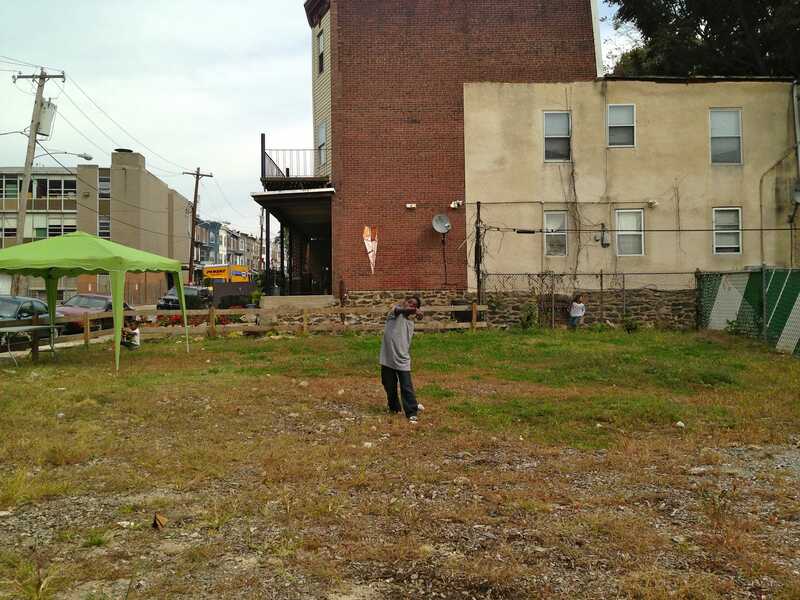 In 2014, Aine and I submitted a proposal to the City of Philadelphia’s Mural Arts Program aimed at improving conditions within the vacant lot on the corner of W Rockland Street and Greene Street. We are excited to announce it was approved! The project is now underway and will be completed during the summer months of 2015. The proposed project aims to activate and beautify the vacant lot. The highly visible location makes it possible to further the connection between neighboring blocks around W Rockland and bolster what we’re building here. Improvements will include light landscaping and features that help to break-up the space, making it easier to maintain and inviting use; the installation of a community message board; new plantings and flowers; and a mural on the facade of the last house of W Rockland Street. The mural, visible from Greene Street, will face the open space. The project may also include other interventions developed during the community engagement process. We hope to make our grassroots neighborhood revitalization efforts more sustainable by turning this vacant space into a safe place for residents. The project is designed to be temporary but durable and accomadate long-term temporary use, in this period between blight and possible redevelopment. It will also be accessible and costs will be kept low, so that the ideas put in place here can be easily replicated by anyone elsewhere – from your average D-I-Y citizen to grassroots community groups like ours. Zoom around this Google Map of the space and get a lay of the land. 4819 Greene is owned by the City of Philadelphia; 4817 Greene is privately owned by the tax delinquent and missing-in-action Church of God by Faith; and 4815 Greene is owned by the Philadelphia Housing Authority. Special shoutout to the lady crossing the street in the satellite image! Michelle Oosterbaan, a contemporary artist working with the Mural Arts Program, will paint the mural. Oosterbaan is currently working on the color pallet and mural concept, after meeting with residents and talking about the ideas and things they would like the mural to evoke. 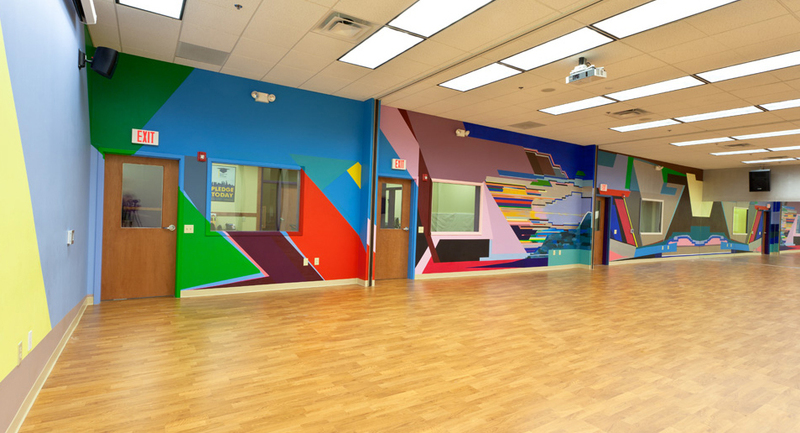 Her abstract mural at Philadelphia Center for Arts and Technology (PCAT) in West Oak Lane is what first caught our eye. The mural will add beauty and brightness to Southwest Germantown and link the houses on W Rockland and Greene. The side-wall of the house where the mural will be painted was previously blocked by the abandoned properties that once stood on Greene Street, and now has a new audience. 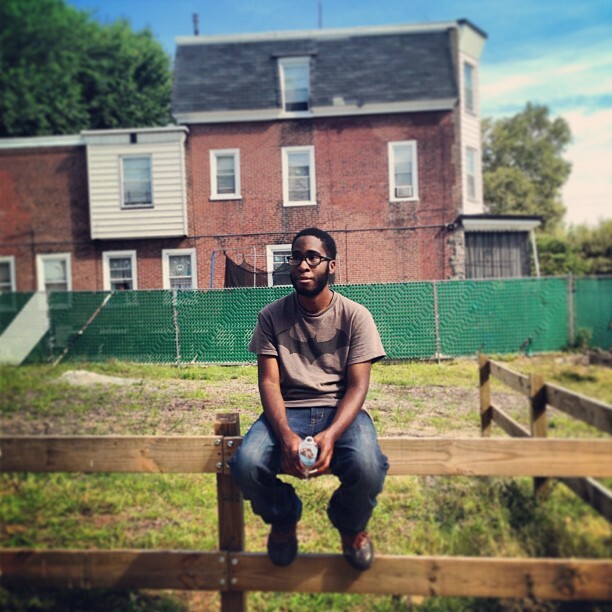 Kevon flies a paper airplane in October 2013 in front of 74 W Rockland St, where the mural will be installed. 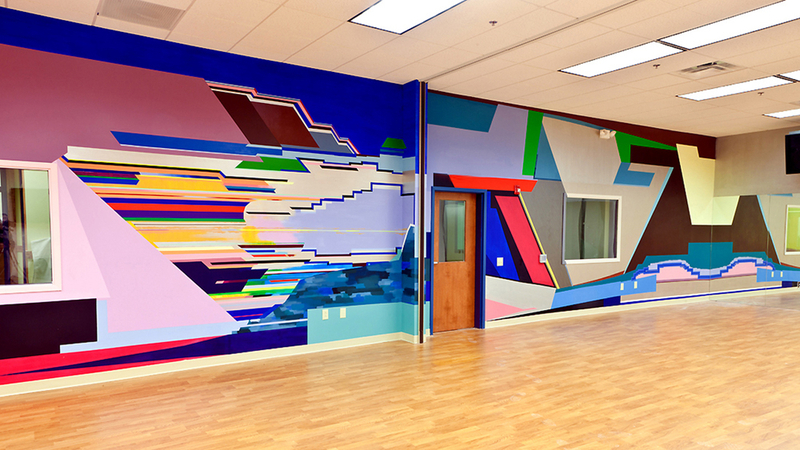 Michelle Oosterbaan’s mural “Pulse” at the Philadelphia Center for Art and Technology. Michelle Oosterbaan’s “Pulse” at Philadelphia Center for Art and Technology, a collaboration with the Mural Arts Program. 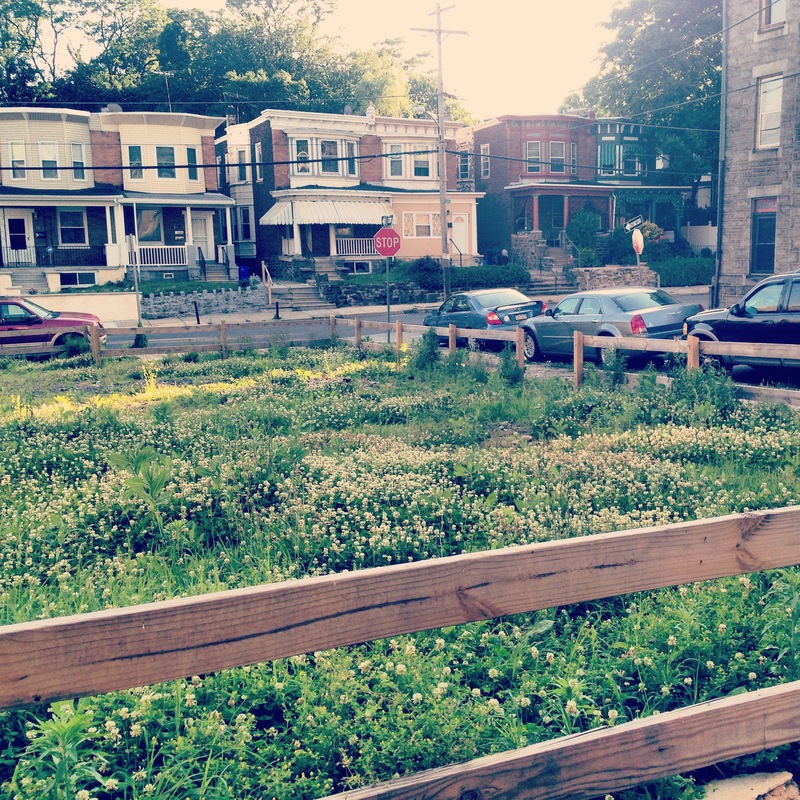 Many people think maintaining vacant land is really the city’s responsibility, and that might be true. But shouldn’t it be easier for residents who want to care for and reimagine these spaces? With this project, we think we can make it easier. It seems kind of bonkers that the solution for community-managed vacant land tends to go from keeping lots litter free and the grass mowed, to community gardens and urban farms, with little in-between. A fence around a vacant lot is sometimes not enough. And let’s face it, community gardens are hard – we know this because we built one in another vacant lot at the top of our block. 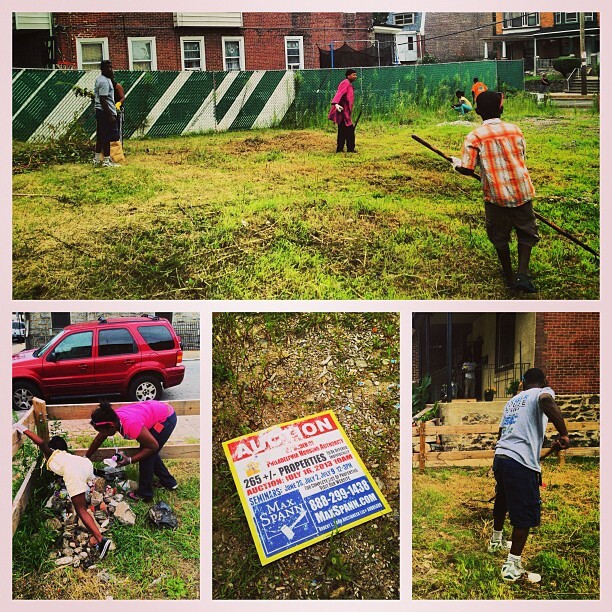 We want to uncover more creative in-between uses for vacant lots that can be done on the cheap. At the same time, there are many residents living in Philly neighborhoods, like ours, that lack resources and organizational capacity to take on this kind of project from scratch. We think they just need a how-to. Every part of this project will be documented and shared online here at rocklandstreet.com for anyone to adapt or copy what we’ve tried, without having to reinvent the wheel. We’ll post tips for getting neighborhood participation, detailed instructions for how to create anything we build for the lot, clever fundraising tactics, and more. Interestingly, this wide open space is a relatively new addition to our neighborhood fabric, thanks to the demolition of two abandoned rowhouses that towered over the community, some say for over 20 years. 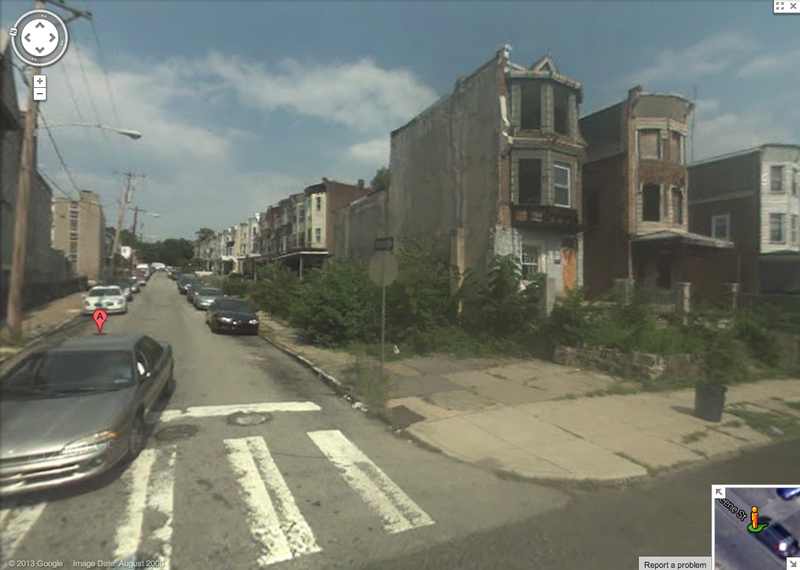 It wasn’t until June 2011 that the footprints of the looming three-story houses (4815 Greene and 4817 Greene St) joined the adjacent overgrown lot (4819 Greene), already a popular illegal dump site. The story of how that happened is not exactly typical. Over Memorial Day Weekend in 2011, Mayor of Philadelphia Michael Nutter paid a surprise visit to the block to see the Grow This Block! garden project – a day on which over 30 households on W Rockland St planted fruit, veggie, herb, and flower gardens in their front yards. The Mayor had read an article by Inga Saffron about the planting project in The Philadelphia Inquirer and showed up with the newspaper in-hand. It was then that he toured the block and saw the condition of the abandoned properties. Wildness. Google Maps image of the space in 2008. Abandoned houses at 4817 and 4815 Greene St directly next to the vacant lot, covered in graffiti in 2009. L&I had already declared the buildings imminently dangerous, after a re-inspection requested by the community. But within days of the Mayor’s visit, the demolition was scheduled. “When neighbors are trying to make something happen, we, the city, have to meet them halfway,” Mayor Nutter told the Inquirer. What happened next is perhaps more typical. After the houses were demolished (yay!) the lot was left unprotected without a fence, and the ground remained a sandy pit with bits and pieces of rock and concrete from the houses (doh!). Soon cars and trucks began parking in the lot and illegal dumping returned. Navigating what to do next was challenging. By 2013, it was clear we had to find an alternative use for the vacant lot and work to turn the space into something that neighbors could enjoy. We began with simple beautification projects. We also hosted community events in the lot, including yard sales and a kids Halloween party. The bottom of the block began to look and feel differently. It began to look like a space people cared about. The question now is how to make more people care about this vacant lot (and others around the city), which is a big part of what this project is all about. 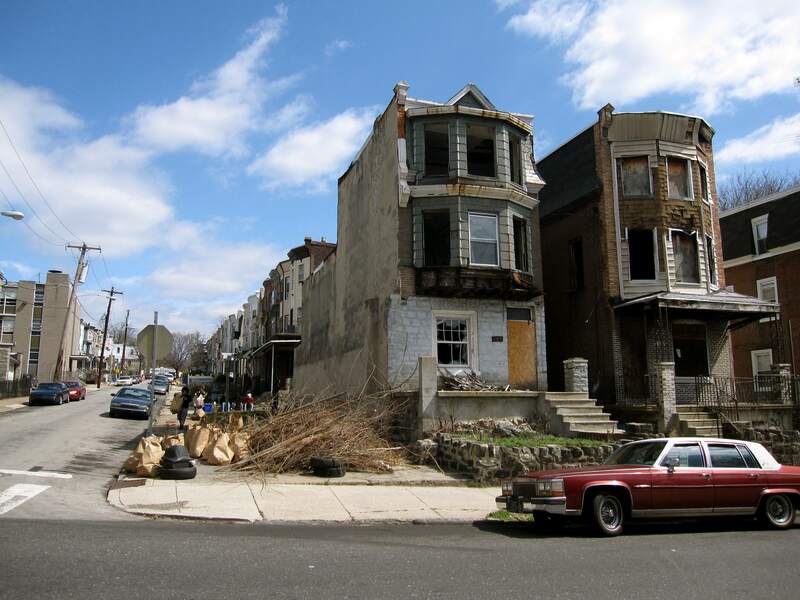 In 2009, residents on W Rockland St began organizing cleanups of the abandoned properties, working to maintain the space and put an end to illegal dumping. 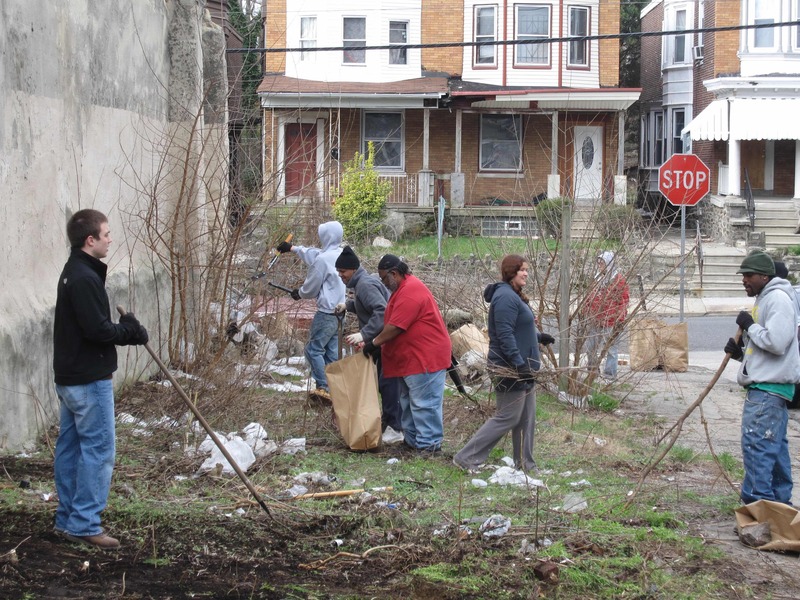 Philly Spring Cleanup, April 4, 2009. 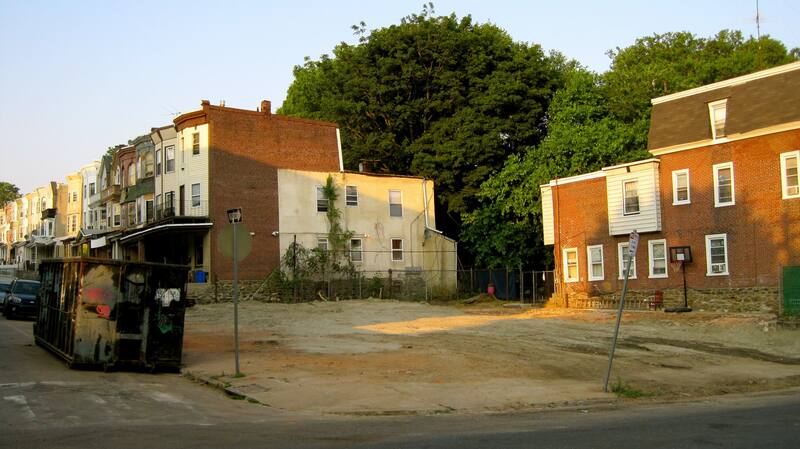 4819 Greene St after W Rockland St Project’s Philly Spring Cleanup 2009 project in which the lot was cleaned. 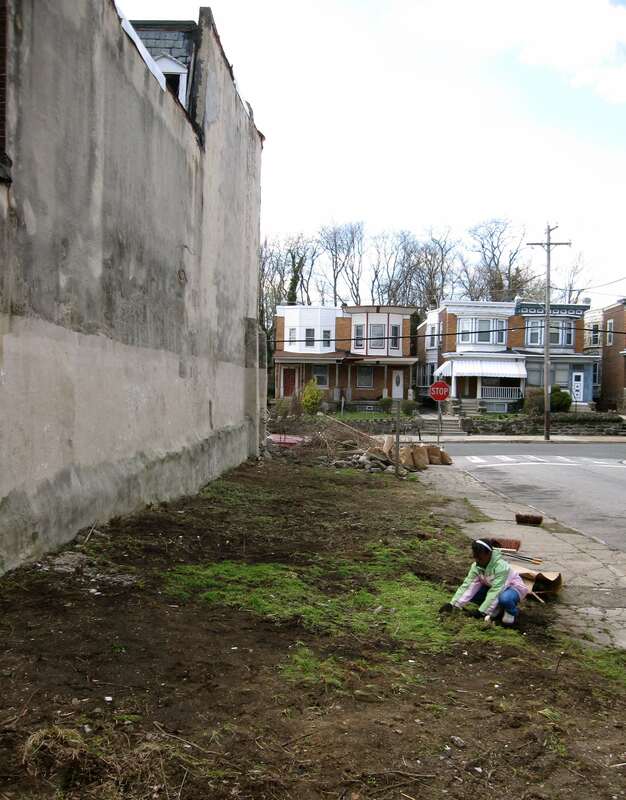 4819, 4817, 4815 Greene St after W Rockland St Project’s Philly Spring Cleanup 2009 project in which the lot was cleaned and graffiti was removed from the front of the houses. 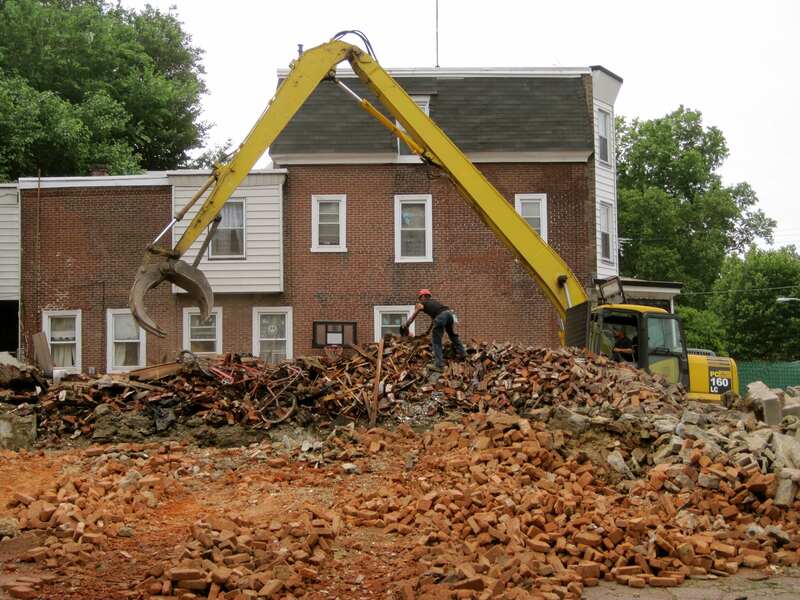 Demolition of 4817 and 4815 Greene St in June 2011, funded by the Neighborhood Stabilization Program (U.S. Department of Housing and Urban Development), managed by the Redevelopment Authority. W Rockland St’s very own sand lot. The condition of the lot after the demolition of the houses in June 2011. Germantown Beach. 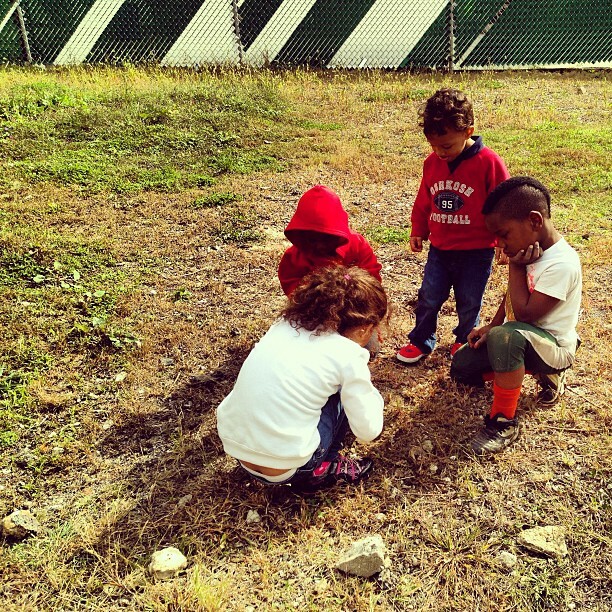 Kids play in the sand lot in September 2011. Volunteer Mark Browning, a real-life Batman. 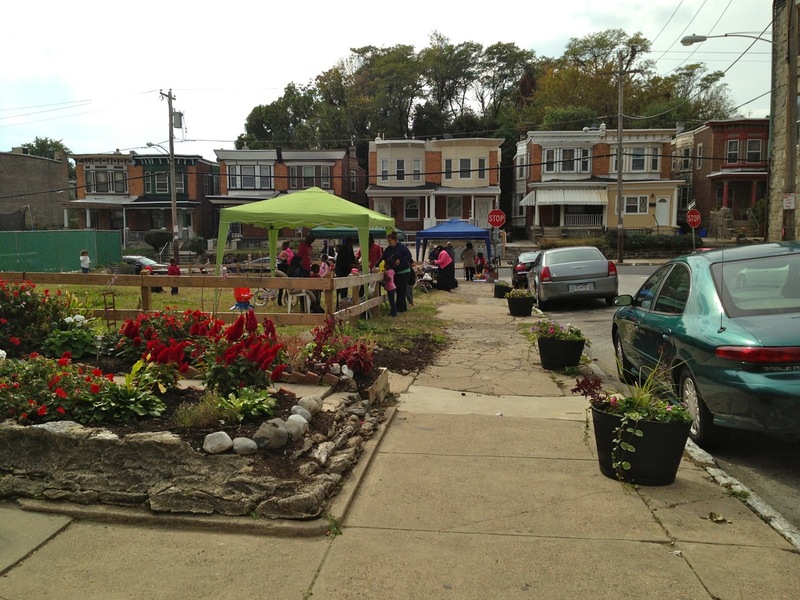 Neighbors held a flea market in the lot in 2013. After the residents at the last two houses planted gardens, neighbors worked together to install several flower planters along the border of the lot. Keeping up the sweep up. Kids play in the lot. 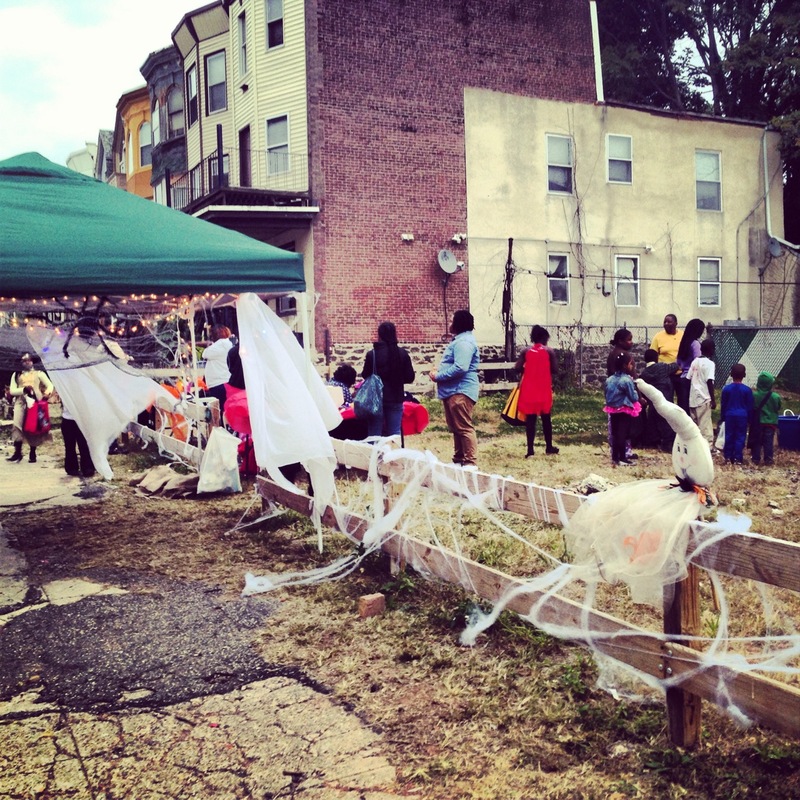 For Halloween in 2013, the W Rockland St Project organized a kid’s party in the vacant lot with candy, games and prizes. If you’re interested in helping make this project happen and supporting The W Rockland Street Project, there are lots of opportunities to get involved. Our first community meeting was held on Monday, June 22 at the steps of the DePaul Catholic School. Join us at the next one (date TBD) and contact us if you have immediate questions. We will be working to increase communication and engagement with residents of the 4800 block of Greene St, who face the vacant lot, the flanking 100 blocks of Logan St and Wyneva St, the 4800 block of Germantown Ave, and other surrounding blocks. Sign-up for our email list! 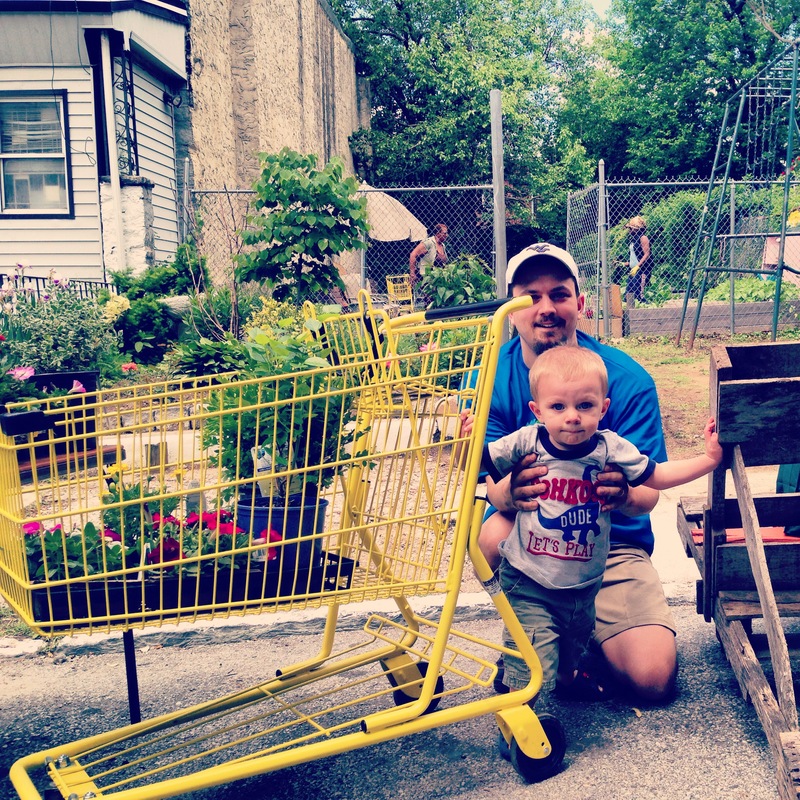 Keep up with The W Rockland Street Project! We’ll send very occasional emails with stories from the block, along with updates about our vacant lot project with Mural Arts Program. Full disclosure: Emaleigh Doley is currently working on the Mural Arts Program’s citywide public art exhibition Open Source (coming October 2015) as a programming consultant. The idea and development of this project however predates that engagement. Is the historic YWCA building on Germantown Avenue really going to be demolished? If you’re a resident of Germantown, by now you’ve likely heard the news that the former-YWCA building at 5820-24 Germantown Avenue has been threatened with the wrecking ball. You probably also have A LOT of questions about that. 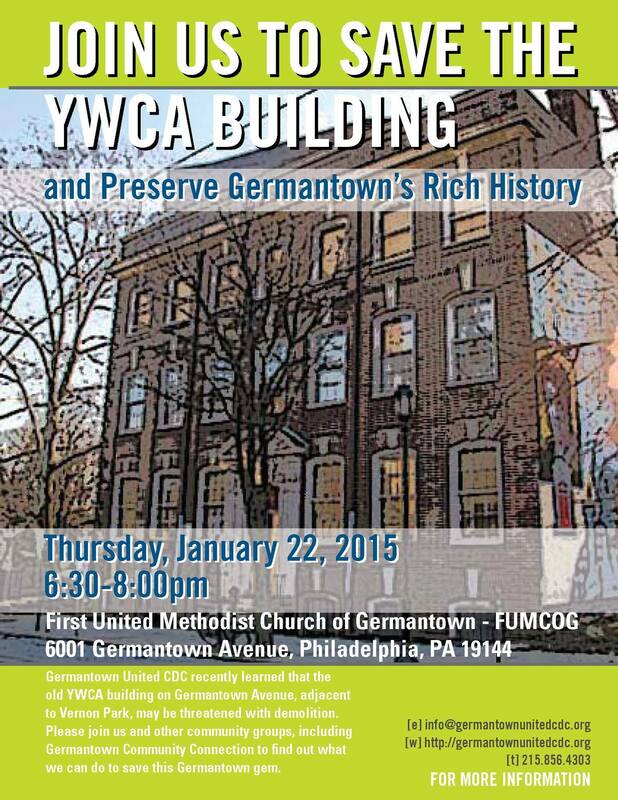 Germantown United CDC (GU) has convened an emergency community meeting on Thursday, January 22 at 6:30 PM to discuss the fate of the historic building, which sits next to Vernon Park on Germantown Avenue and is part of a cluster of large vacancies on the corridor, including Germantown Town Hall and Germantown High School. Right now, the Philadelphia Redevelopment Authority (PRA) owns the YWCA. In September 2014, the PRA put out a Request for Proposals (RFP) for competitive bids from developers to purchase and rehab the building. You can download the RFP (PDF) and browse other PRA materials in detail at phila.gov/pra. Apparently only one proposal was submitted (oy! what’s the proposal?) and while the PRA likes the proposed development (what’s it like?) they’re having a hard time moving it forward (how come?) so now the PRA might tear the building down if there is no traction (really? why?). Before I freak out about the building getting demolished or decide to advocate for a project I know nothing about, I plan on attending this meeting on the 22nd and think you should too! 1. So… What’s been proposed exactly? According to the email below from GU, Mission First Housing Group is the sole developer, and Ken Weinstein of Philly Office Retail and Center in the Park are partners. What do they want to do and how will the existing business corridor and greater Germantown benefit? 2. What is stopping the Redevelopment Authority from accepting the proposal? Generally speaking, if the PRA has a proposal they like, what is the process for moving a proposal forward? 5. Back in February 2013 – before the PRA even foreclosed on the property – Ken Weinstein did an interview with Flying Kite Media discussing his vision for the YWCA. I’m confused about who is leading the charge. Please fill us in! 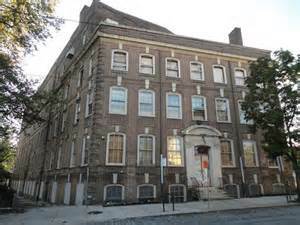 The shuttered YWCA on Germantown Avenue near Rittenhouse Street. The YWCA building has an awesome history and should be preserved. One of my favorite activities growing up was jumping on the HUGE trampoline at the Y while waiting around for my sister – who was far better at gymnastics – to finish lessons. But forgive me for not immediately laying down in front of the building to save it from demolition. There are lots of crazy stories out there about people in power (who know better) using scare tactics to get what they want and how this unfolded doesn’t feel right. Remember that time the Philadelphia Housing Authority threatened to leave Germantown’s Queen Lane Apartments tower up (yes, up!) because of disagreements with residents? More recently, PRA executive director Brian Abernathy penned an obnoxious op-ed for the Inquirer blaming artist James Dupree for denying an ENTIRE neighborhood access to healthy food, all because the artist didn’t roll-over when the City attempted to seize his studio for a new supermarket. Yuck. Our local government sometimes does reprehensible stuff like this. I gather there are issues with transparency on all sides. Come out to the meeting with an open mind and do your due diligence to get the facts if the revitalization of Germantown is an issue you care about. Germantown United CDC has confirmed that Ken Weinstein and representatives of Mission Housing First and Center in the Park will be in attendance to discuss the RFP they submitted to the Philadelphia Redevelopment Authority. The PRA will also be in the house to talk about the status of the proposal and the condition of the building. Who else will be there? I dunno. Let’s find out! “Germantown United CDC (“GU”) recently learned that the old YWCA building on Germantown Avenue, adjacent to Vernon Park, may be threatened with demolition. Please join us and other community groups, including Germantown Community Connection, for a meeting at the First United Methodist Church of Germantown (“FUMCOG”) on January 22, 2015, 6:30pm, to hear about the threat to this significant historic centerpiece in Germantown’s “Town Center” and the proposal on the table that may save it. The Philadelphia Redevelopment Authority (“PRA”) owns the Old YWCA after it foreclosed against Germantown Settlement four years ago. 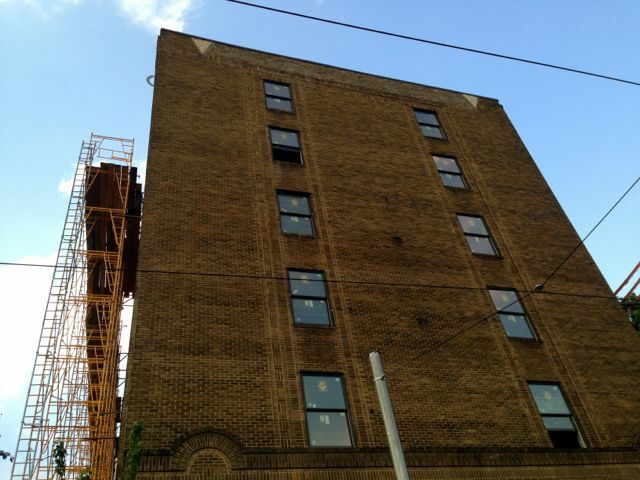 Last Fall (September 2014), the PRA put out a Request for Proposals for competitive bids from developers to purchase and rehabilitate the structure at 5820-24 Germantown Avenue. Given the historic nature and significance of the building, the RFP stated that the “City may be willing to subsidize masonry and structural improvements in an amount not to exceed $1,000,000.” Following the release of the RFP, a site visit was led by the PRA for interested developers to have an opportunity to tour the building. The site is in a significant state of disrepair resulting from eight plus years of vacancy, two fires, and multiple acts of vandalism. Despite considerable developer interest initially, only one developer submitted a proposal to the PRA. Nugent properties on Johnson Street that served to save those buildings. As Corridor Manager, GU feels obligated to convene a meeting of stakeholders to hear all the facts, to understand the existing proposal, and to create a community coalition to save the Old YWCA. At this point, the only proposal legitimately before the PRA, based on response to the competitive RFP process, is the one submitted by Mission First. GU supports a fair and open process that allows community voices to be heard without advocating for a specific proposal. Our goal is to save the YWCA from demolition and ensure that this Germantown gem is preserved and put to productive use. So, who is Mission First (we all know Center in the Park)? What is the proposal? Is this something our community should support? These questions – and any that you wish to raise – are welcome at the meeting on January 22nd 6:30pm at FUMCOG. PLEASE HELP SAVE THIS SIGNIFICANT BUILDING FROM THE WRECKING BALL!! The Changing Germantown Facebook group offers a broad view of development activity at play in and around Northwest Philadelphia’s Germantown neighborhood and insight into what community stakeholders are thinking. Members are invited to freely post photos, articles, comments and opinions related to urban planning and design, community development, and zoning issues in Germantown. December 8th marks an important day in the history of Germantown. No, there’s no historic battle. But what is on the calendar for this Monday is a slew of events concerning development and other neighborhood revitalization efforts coming to Germantown in the near future. What’s on the agenda? The Emerald Isle, also known as Vernon Park, is in the early stages of a park redesign. 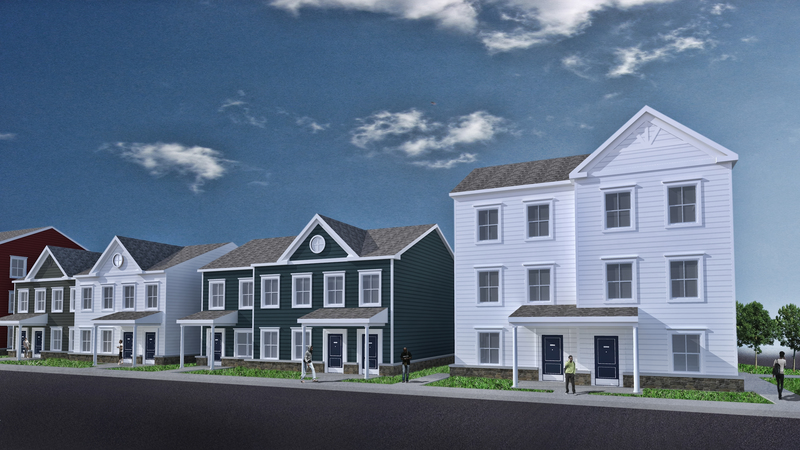 The Women’s Community Revitalization Project has proposed 35 new affordable town homes on vacant woodsy land on Wister Street in East Germantown. 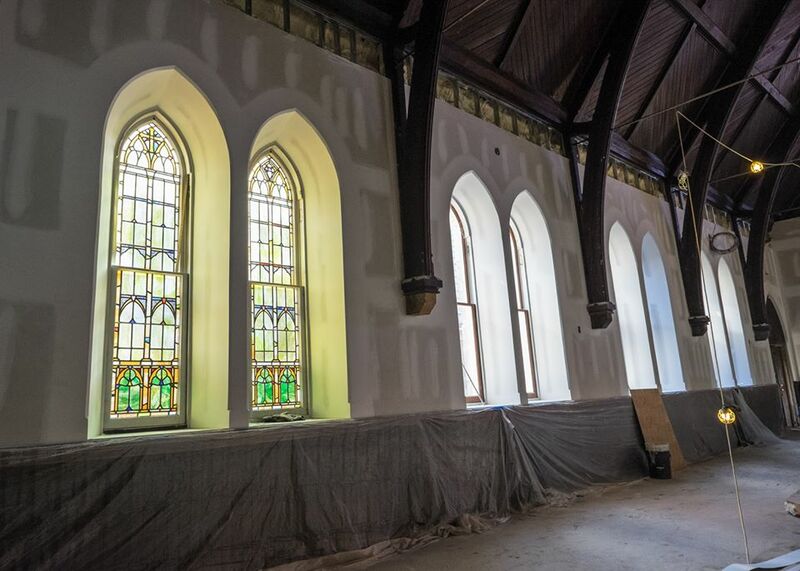 We have a new school coming to the 140-year-old St. Peter’s Episcopal Church at Wayne Avenue and Harvey Street, originally designed by architects Frank Furness and George Wattson Hewitt. St. Peter’s is fast transforming itself into the Waldorf School of Philadelphia’s new campus. Also on the education front, the Germantown Community Charter School Coalition will present their plan for the reuse of Germantown High School before the School Reform Commission, complete with a busload of supportive Germantowners in tow. And much more. Yes, December 8th, 2014 is a very important day for Germantown. Pick a meeting or presentation and go! The Charter School Application is in the approval stage. (Phase 1) We are scheduled for a (15) minute public hearing presentation to an audience before the SRC (School Reform Commission). We need ALL ALUMNI, FAMILY, FRIENDS, COMMUNITY AND SUPPORTERS AT THIS MEETING. RIDE the BUS on US: The bus leaves at 10:30 from the former Germantown High School at Germantown and High Sts. YOU MUST RSVP at GtownCharter@gmail.com TO CONFIRM A SEAT ON THE BUS YOUR NAME MUST BE ON THE LIST. You can also meet us there. Be part of the Sea of Green in support of the Germantown Community Charter School. Equally important they are accepting public testimony beginning at 3pm. We need as many people as possible and representatives of our partner organizations to give their words of support. To sign up to speak you need to call: 215-400-4010. Dear Friends and Neighbors of Vernon Park, Come join us and see the latest design for the Master Plan for Vernon Park from the Pennsylvania Horticultural Society design team. This is an exciting time and some parts of the plan are already underway. Please come promptly so we can have a good block of time for the presentation and questions. If you haven’t been to our meetings before, please note you need to use the back entrance to the Center in the Park from the parking lot off Rittenhouse Street and ring the bell at the door. Property Description: The property is vacant land located on the block bounded by Wister, Rufe, and Collom Streets, less than one block away from the Wister Station along the SEPTA Regional Rail Line. The address is 417 E. Wister (along with 423, 431, 443, 445 E. Wister St. and 5120 Rufe St.). The nearest cross street is Wister and Rufe. 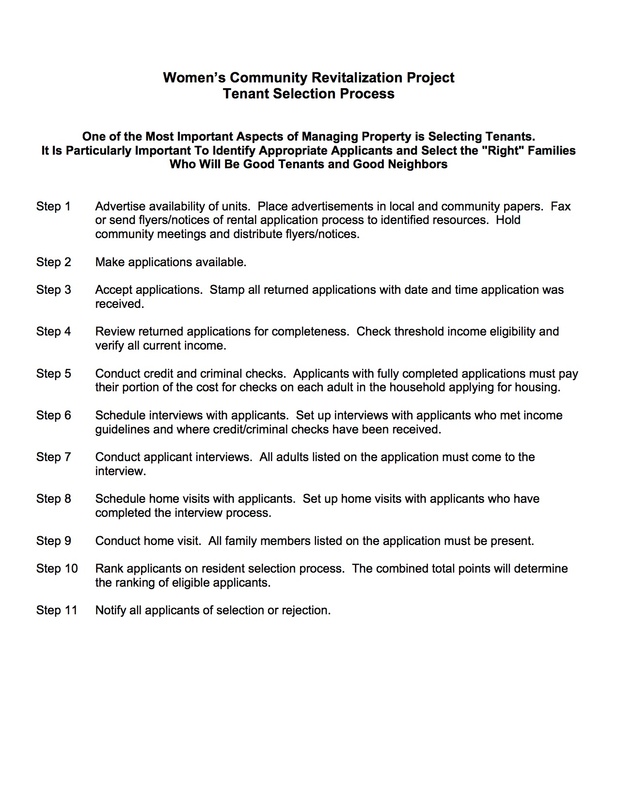 The property is located in a RSA-2 zoning district. 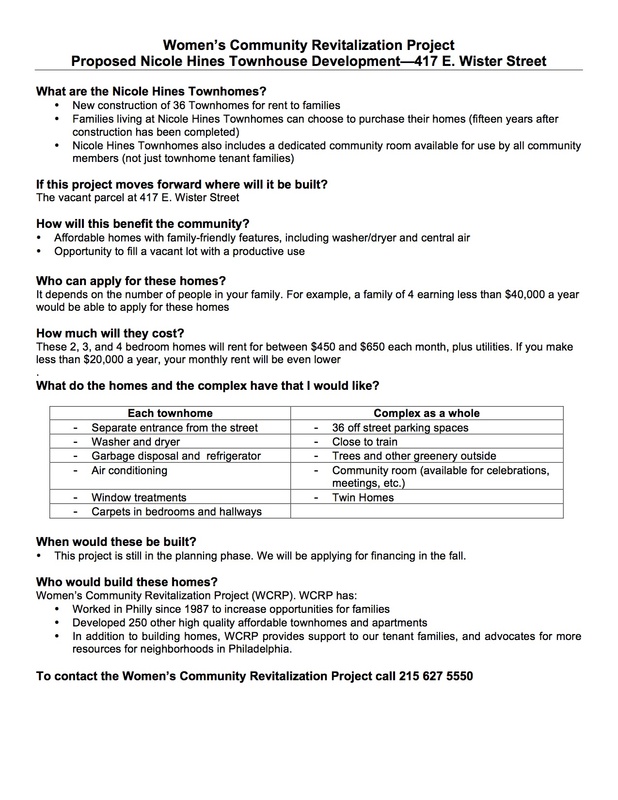 Contacts: Email paylesworth@wcrpphila.org if you would like a copy of the zoning application. Join The Waldorf School of Philadelphia Leadership Team and members of the Board of Trustees for a community-wide Town Hall meeting. We will provide a preliminary overview of our relocation plans and offer an opportunity to ask questions and share concerns. Members of the current Waldorf community and the wider Germantown community are all invited. Bring friends, neighbors, grandparents, prospective families – all are welcome! If you cannot attend but have a question you can forward your questions to Kerry Hoffman at schoolchair@phillywaldorf.com. Overview of project, history of how and why we are moving. Agenda: Updates on the conservancy effort of 5328 Wayne Avenue (David Gilfillan); progress report on the Growbot sculpture at the Penn Street community garden (Birdie Busch) and the Penn Knox Community Information Board at Maplewood Mall; safety report from the working committee; annual pot luck and fundraising auction. Save the date: January 12, 2015 next PKNA monthly meeting on the 2nd Monday of the month. In September, we introduced a resolution calling for a hearing regarding the current state of park and street trees and their continued maintenance. The hearing has been rescheduled for Monday December 8, 2014 at 12 PM. Tree Germantown is a big supporter of this bill! Learn more about it and support this effort. The Changing Germantown Facebook group was created in response to a noticeable uptick in development activity in the Northwest and few public forums for residents to freely discuss and access such information. This group offers a space for focused conversation on such issues. 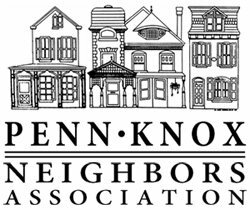 Members are invited to freely post photos, articles, comments and opinions related to urban planning and design, community development, and zoning issues in and around Northwest Philadelphia’s Germantown neighborhood. The group offers a broad view of current development activity at play in the neighborhood and insight into what neighborhood stakeholders are thinking. Women’s Community Revitalization Project (WCRP) has proposed building 35 new affordable town homes on vacant woodsy land in East Germantown. 417 E Wister is located across from the Woodford Tennis Club. Though just a few blocks off of Germantown Avenue, this stretch of Wister is fairly desolate and a regular illegal dump site. Women’s Community Revitalization Project is required to discuss the development at a public meeting with community members and the Registered Community Organizations (RCOs) with geographic boundaries that include the property. On Monday, December 8, 2014 (see the notice) the Wakefield 49ers Community Development and Improvement Association will host the RCO meeting in advance of the WCRP’s December 17 hearing before the Zoning Board of Adjustments. If you’re interested in participating in the conversation about this development and the revitalization of East Germantown, please attend! Informational materials provided by WCRP are included below, along with Google map satellite imagery of the area. Google map satellite imagery of the area. The 5300 block of Germantown Avenue will soon be home to a new 19-space surface parking lot at the corner of W Penn Street, joining two existing lots that front the commercial corridor within a single block. 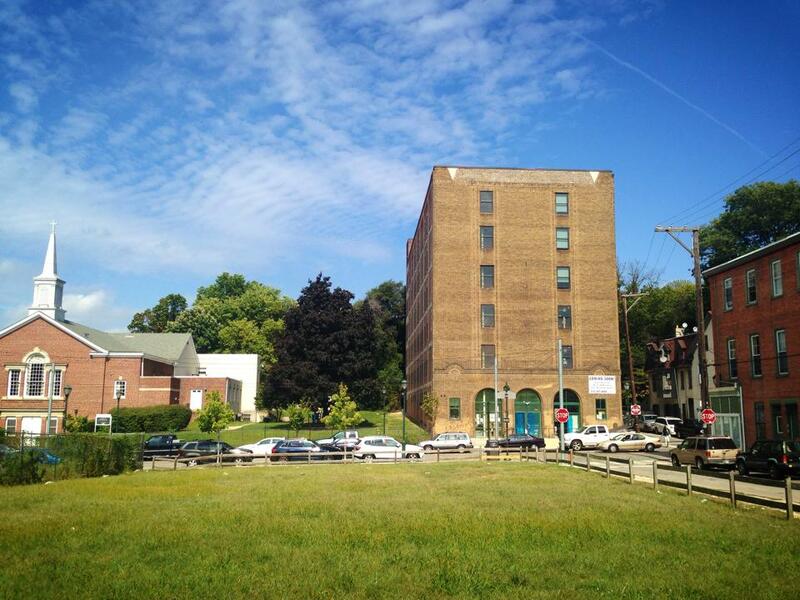 The grassy property is owned by developer Ken Weinstein, who is also renovating the six story building across the street at 5301 Germantown Avenue. There is much possibility in Philadelphia’s vacant land, so the idea of yet another private lot is nothing short of a buzzkill to this stretch of the corridor, which is showing a glint of possibility marked by new businesses, new construction projects and renovations. While a parking lot may not sound very exciting, Weinstein’s development in its entirety remains one of the most significant along the corridor in years. It has however proved difficult to get much information about. Future surface parking lot on the 5300 block of Germantown Ave at Penn St, looking towards the Hosley Temple Church and 5301 Germantown Ave. In the summer, a group of concerned Germantown residents (myself included) and business owners frustrated by a lack of transparency reached out to the Department of Licenses and Inspections and various other agencies of the city with questions about the development process and potential impact on the neighborhood. The primary concern is what appears to be the subversion of the city’s zoning process which in effect has prevented public notifications about the nature of the building use, stifling dialogue and community input. L&I’s decision-making overlooks many principles of comprehensive planning set forth in the new zoning code. The parking lot, which is not yet under construction, will be located on the contiguous parcels of land at 5322, 5324 and 5326-28 Germantown Avenue at W Penn Street, across the street from the building under discussion. The two other large private lots on the block serve Germantown Friends School and St. Luke’s Episcopal Church. Hosley Temple Church and the new Around The Clock Home Health Care office (currently under construction) have wide driveway entrances on the Avenue and private parking lots tucked away behind their buildings. The entire block has free on-street parking throughout. Which begs the question – how many parking lots are too many for one block of Germantown Avenue? Surface lots on city blocks create distance between destinations and add little to the streetscape. This dead space no doubt impacts the surrounding business corridor and overall pedestrian experience. A walk along the neighboring 5400 or 5200 blocks of Germantown Avenue tell a different story. “Yay, surface parking,” said nobody ever. – @dragonballyee via Twitter. Note, map satellite image does not show the new construction between Hosley Temple Church and the Germantown Friends School parking lot on the east side of Germantown Avenue. News of the parking lot is but one conundrum. If you’re anything like me, you probably have a lot more questions about how each component of the 5301 Germantown Avenue development will fit together. But good luck getting your questions answered. In the interest of a more transparent process, included below is our most recent correspondence about the development with L&I. Germantowners should have a voice in the rebuilding of our neighborhood and the right to know and ask questions about new developments that impact where we live, work and play – for better or worse. An informed citizenry is an asset to the revitalization of Germantown. 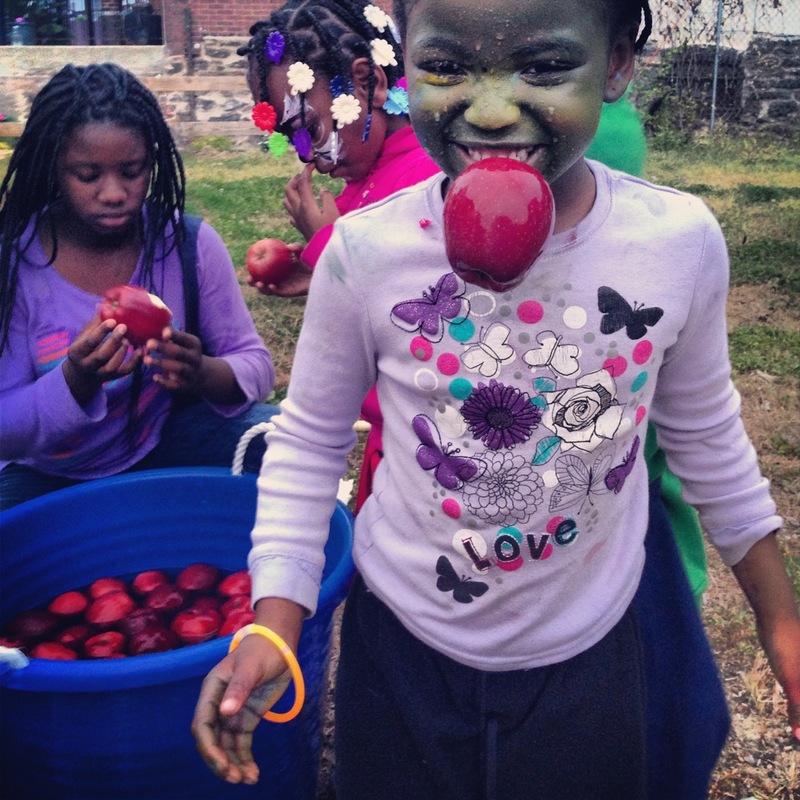 Last month, Germantown United Community Development Corporation (GUCDC) launched the micro-grant program Stone Soup Saturdays, awarding grants to artists, designers, gardeners and other creatives for projects in four Germantown locations. We’re excited that one of the locations just happens to be W Rockland Street and hope our idea for a neighborhood bulletin board inspires you! Germantown United is looking for projects with the potential to create a catalyst for future beautification and development in the neighborhood, foster community ownership of public spaces and increase community pride. We like the sound of that! While the deadline for proposals has past for the other three project locations, the deadline for W Rockland St has been extended until we find the right match. To help shape the Stone Soup project on W Rockland St, we’re offering applicants some suggestions for a community exchange tool we’d like to experiment with on the block. Recognizing that communication is paramount, we’re looking for a designer, architect or builder to help us create a neighborhood bulletin board. Our plan is to build two and install the boards at the highly visible vacant lot at the corner of Greene St and W Rockland St and outside of the community garden at 15 W Rockland St.
Our hope is that the bulletin board will become the go-to place for W Rockland St Project flyers and community news, helping to connect and inform nearby blocks. We would like the design to feature an accessible space for anyone to post flyers and a protective enclosed case for official W Rockland St Project communications (we distribute A LOT of flyers). The design must be able to withstand outdoor weather conditions and an urban environment. Our project is all about the community. After the winning proposal is selected, we’ll organize a build-day with GUCDC and the designer and invite neighborhood residents to participate in the installation. Sure, lots of neighborhood communications have moved online, but here in Germantown we know there is still a place for the paper flyer. 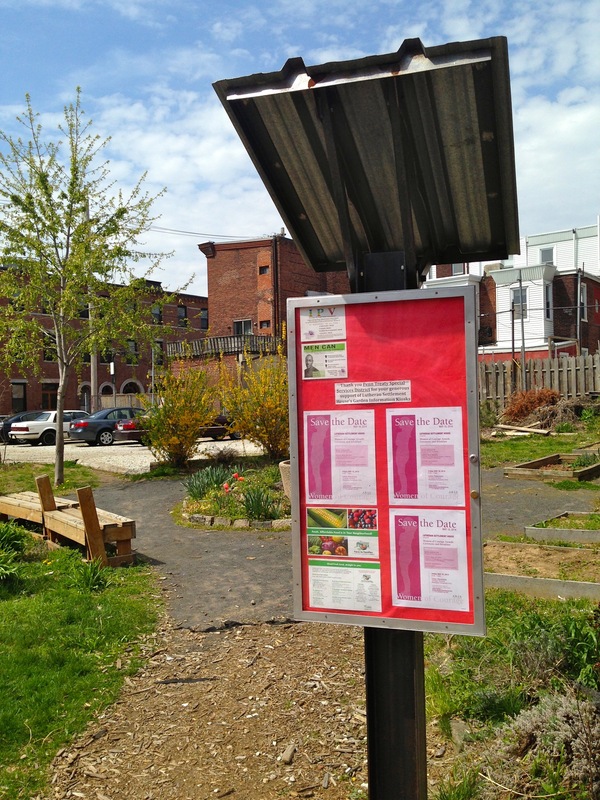 Over the past couple of months, we’ve been snapping photographs of outdoor bulletin boards at parks and gardens around Philadelphia for inspiration. Here are a few examples from Fishtown, Mt. Airy and Northern Liberties. 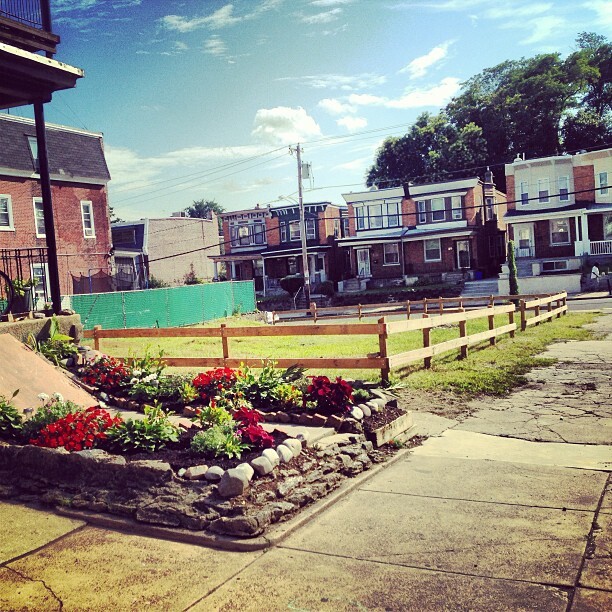 My favorite design sits in Lutheran Settlement House’s garden on Frankford Avenue in Fishtown, near Master Street. 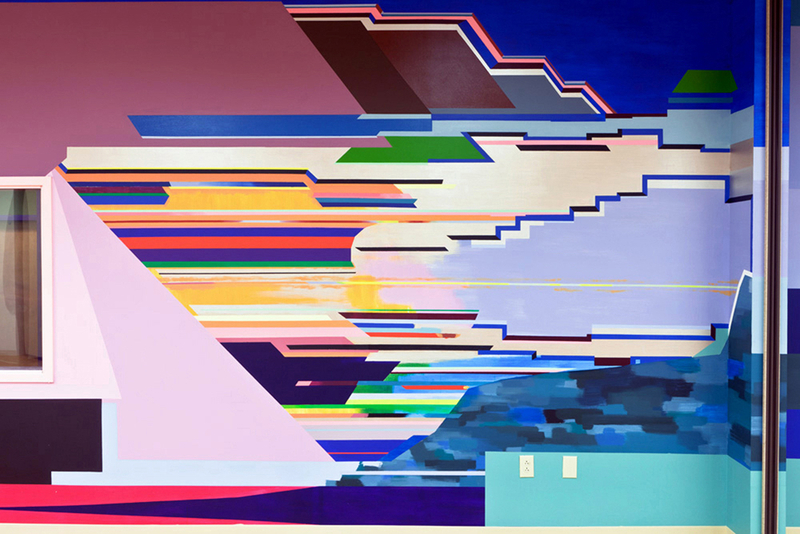 Grants of up to $1500 will be awarded for materials and artist stipends. There is a total of $7,500 available for implementation of all selected proposals. 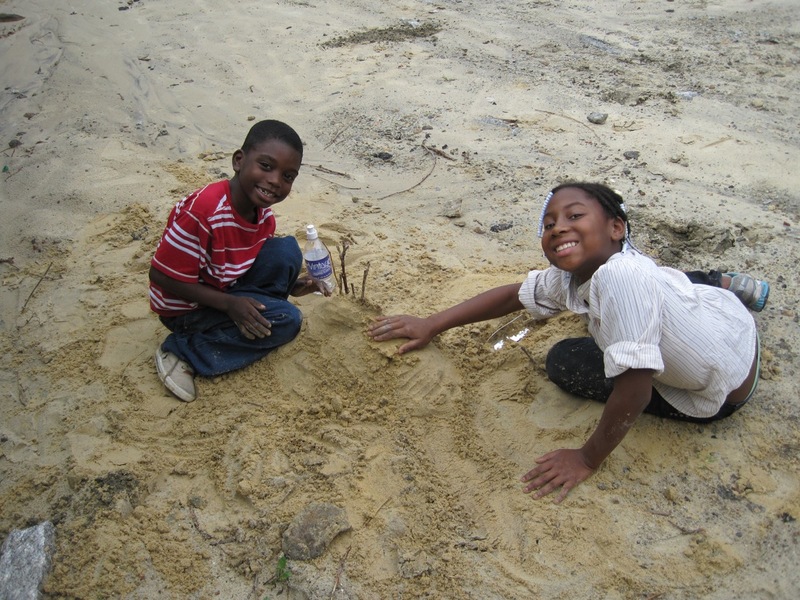 This program was made possible by a grant from the Samuel S. Fels Fund. The W Rockland St Project will also help to assist with additional fundraising and materials donations to help lower the cost of the project. 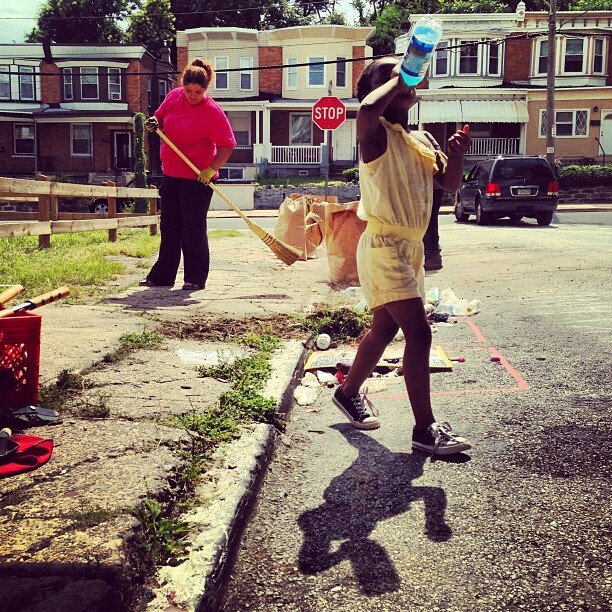 The three other Stone Soup project locations identified by Germantown United CDC are: the unit block of West Haines Street at the garden space on the south side of Germantown Town Hall, the wall at the southwest corner of Chelten and Greene along the southbound bus stop at Greene St and Chelten Ave, and parking lot entryway of the Germantown Life Enrichment Center (GLEC) at 5772 Greene Street. GUCDC is no longer accepting applications for those projects. To submit your project for W Rockland Street, download the Stone Soup Saturday application and email your pitch to info@germantownunitedcdc.org. If you have any questions, feel free to contact us! 4811 Germantown Avenue, part of the former Germantown Charter School Campus. Over the past few years, Weinstein has acquired a growing number of properties in the area, many of which are concentrated along Germantown Avenue, the neighborhood’s main thoroughfare which features several business districts. Ongoing development of the five building six acre Settlement campus has the potential to redefine a significant portion of Germantown Avenue nearby Wayne Junction Station. At Settlement, the youth drama school Greatness Is In You will join New Directions for Women, a residential penal facility for female ex-offenders that has operated on the campus for over 20 years, and the for-profit adult daycare center Tori’s Garden of Eden, also under renovations. Two other buildings remain vacant. After two contentious zoning meetings about the adult daycare in February and April, near-neighbors are eager to engage in a healthy dialogue with the developer and build a vision for the entire campus. 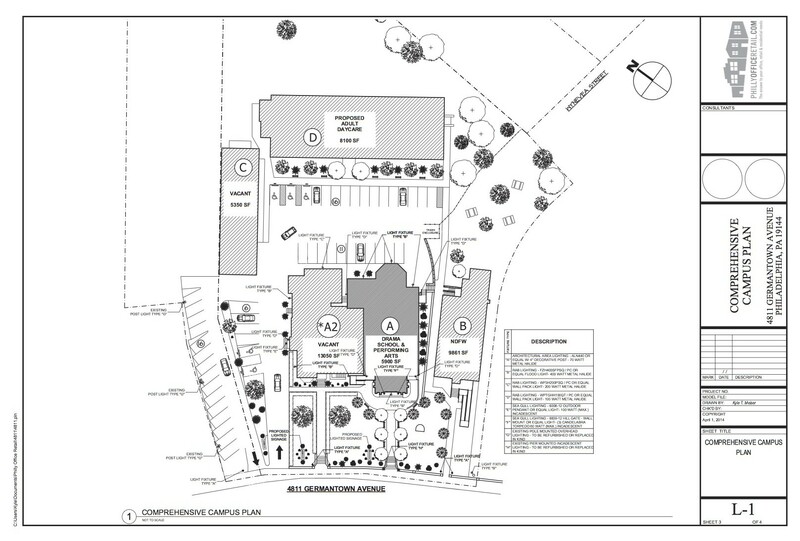 A diagram of the former Germantown Settlement Campus, courtesy of Ken Weinstein. Click to enlarge. The Schaeffer School at 4701 Germantown Avenue. Photo taken on November 16, 2013. Weinstein also owns several other significant buildings in the immediate vicinity, including the former C.W. Schaeffer Public School at 4701 Germantown Avenue, adjacent to the Settlement campus. Together, these large scale properties front nearly an entire block of the Avenue, less than half a mile away from Wayne Junction Station. Beyond Settlement, there is currently a rising debate about 5301 Germantown Avenue, a six-story property owned by Weinstein on a largely historic stretch of the Avenue. That building is less than one mile away from the Settlement campus and currently under redevelopment. The property is said to feature a 1,600 sq ft cafe and restaurant space on the ground floor and 11 market rate apartments (one and two-bedroom units), as confirmed by the developer on a neighborhood Facebook group and advertised on the building facade. The primary use of the building is rumored to be a 100-bed shelter, managed by an unnamed non-profit. When pressed about the unadvertised building use at a recent Baynton Hill Neighbors civic group meeting, Weinstein said that he could not legally disclose the name of the non-profit or the nature of the additional residential use. 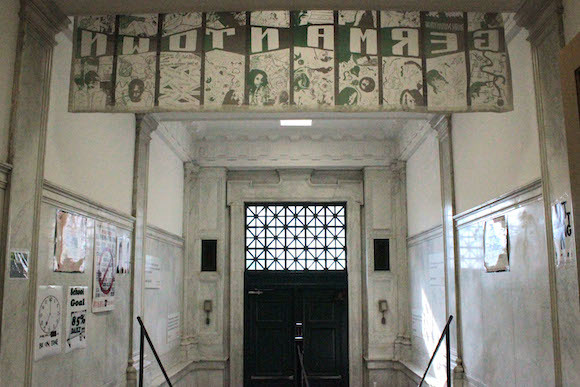 Further along the Avenue, Weinstein recently toured Germantown High School – perhaps the largest vacant building on Germantown Avenue at 355,372 sq. 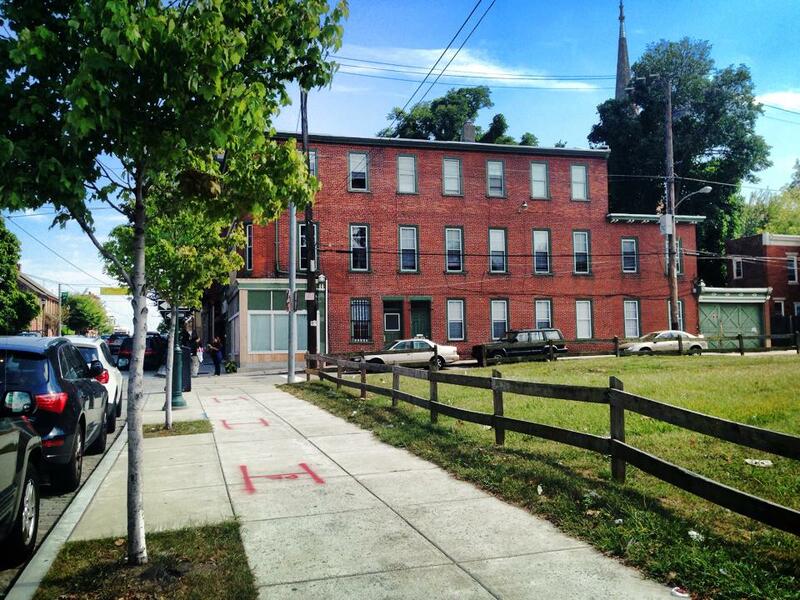 ft. – and is considering purchasing the property from the Philadelphia School District. 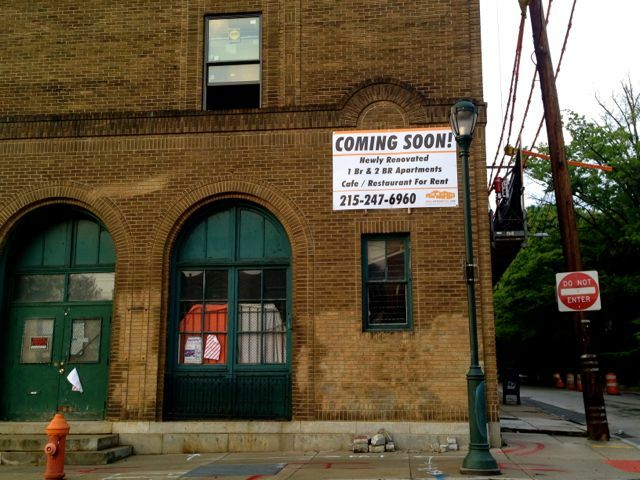 What’s Happening at 5301 Germantown Avenue? Mayor Nutter shows up on W Rockland Street! We’re working on a little something called Grow This Block!